In Windows all processes are given the same priority, by default. In some cases, few programs need more resources to run properly on your machine. In fact, when more resources are allocated to a process then it’ll run smoothly. Let us apply this in a broad manner. When, more resources are allocated dynamically (without any user intervention) to active programs or processes on which the user is currently working on, then, the user will feel that every program is running smoothly. Even though Task Manager can be used to change priorities of process, we can’t use it to dynamically change priorities. We need specialized tools like TopWinPrio to do this task for us. TopWinPrio can increase the priority of the program dynamically which you use at that particular instance and thus improving performance especially on low end computers. The software interface is easy to use and all options are well defined and have their own window. Let us see the Priolist tab. This window will list all applications that are boosted by TopWinPrio and it’ll also mention the time when they are started. This classification list will change (Refresh) dynamically as active programs change, so the active task will be the first in the list and this one will get higher priority. For example, if you look at the screenshot of my window, first in the list is µTorrent. As µTorrent is the foreground process, TopWinPrio will give higher priority to µTorrent over other processes which are in background or whose windows are minmized and thus uTorrent will run smoothly which help of extra resources. TopWinPrio is careful enough to boost desired processes without messing up the normal routines in Windows. 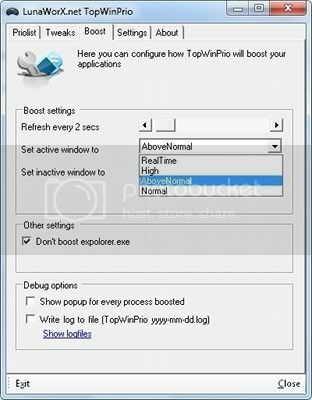 Configuring TopWinPrio is not difficult, you can adjust settings that fits you well. You can also autostart the software with Windows. Reclaim Memory – Force All Processes To Flush The Cache : This is handy Memory Cleaner function, after clicking on it, TopWinPrio will carry the process and it shows you how much memory is released, now if you click on Priolist you will see all process that were flushed. Choose among 4 levels of priority (RealTime, High, Above Normal, Normal), as well as the possibility of lowering the priority of inactive programs. Refresh Time: Decide, for how many seconds should TopWinPrio check the current active application. TopWinPrio (Windows Xp, Vista, 7; 32/64 bit) is a handy little portable program which helps you to automatically to manage system resources for better distribution by changing priority levels. The program is simple, with only few options, but it gets the job done. So, download your free version from this link and boost your computer.